Are you having a semester abroad in our lovely city of Copenhagen? Then do as the Copenhageners do and bike around the town with a student bike from Copenhagen Bicycles. We will help you become the perfect cyclist – the Danish way. We believe in good karma and have therefore created this student offer in Copenhagen, so you can have the best time in our city as a student without spending all your money on transport. If you’re a student, you can rent a student bike starting from 150 DKK per month with free service. If you by any chance have any sort of problem with your bike, simply bring it down to our shop and we’ll swap it for another – no charge and no fees. We will ensure you always have a well functioning bike in the best condition. 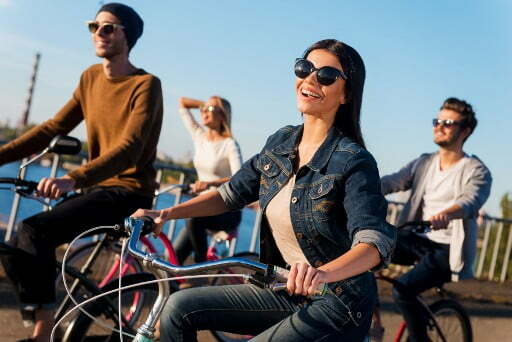 We will make sure we teach you everything about biking around in our beloved town and in no time you will be a professional and safe cyclist once you leave our shop at Nyhavn with your new student bike. There is a required deposit of DKK 1.000,- (approx EUR 134 / USD 159) included in your booking. The deposit will be returned to you when the bike is returned at the end of the rental. DKK 1.000,- (approx EUR 134 / USD 159) added together with your booking and returned end of the rental. – Only valid with student ID Card. (just bring it with you at your pick-up). You can upgrade at any time! You must show a valid student card when picking up the bike. You must leave a 1000 DKK deposit for the bike. The bike includes stickers and our logo with frame number etc. It must be returned in the same condition as you received it.